If you're a betting man, you should know that the odds are good that this won't be my last article featuring the mechanics and health of the Texas Rangers starting pitcher Brandon McCarthy. As my favorite subject, his mechanics have spent a lot of time on my computer monitor playing forward and backward, in slow motion, and in still shots. As a result, I have a small tendency to see a little bit of McCarthy in just about every pitcher. Every once in a while I run into a pitcher whose mechanics have a lot in common with him. Meet University of Texas at Dallas junior Marvin Prestridge. Video shot at 210 frames per second during a fall intrasquad scrimmage. In light of recent mechanical changes, Prestridge doesn't look much like McCarthy does these days [Edit: this may not actually be true since I haven't seen high-speed video of McCarthy's new mechanics], but when I pulled up the video I shot of McCarthy last spring, the similarities were striking. The angles aren't quite the same, so you may have to use a little imagination in places. McCarthy (left) and Prestridge (right) at the top of their leg kicks. 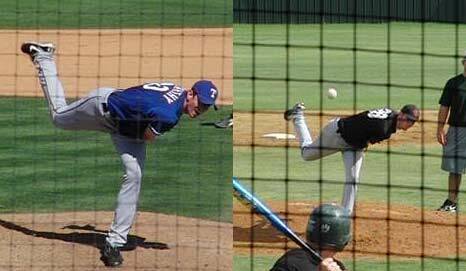 They don't look too similar at the top of their leg kicks, but they appear to have a similar degree of reverse rotation (turning their backs to the plate). McCarthy is more compact, and Prestridge lifts his knee much higher. McCarthy and Prestridge at hand-break. At hand-break, their mechanics are starting to run together. McCarthy sits a little lower on his back leg. Prestridge breaks his hands much closer to his body. McCarthy and Prestridge right before their forearms start to turn over. 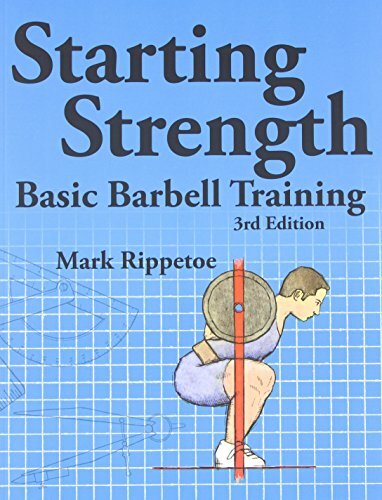 Before foot plant, this is the frame where their elbows stop moving upward and backward (toward 1B), and their arms begin external rotation. You can clearly see McCarthy's inverted W and that Prestridge's arm is below shoulder level with an extended elbow. 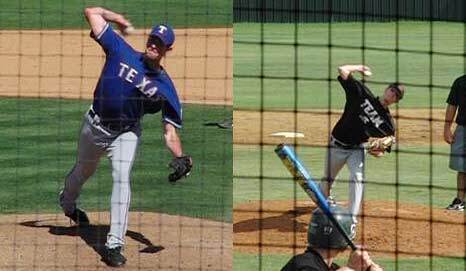 Both pitchers have their arms well behind their shoulders. I much prefer Prestridge's method of picking up the baseball to McCarthy's method from last spring. As a part of the changes he has made to his mechanics over the past 9 months or so, McCarthy's current pick-up features a full arm swing that positions his pitching arm much like Prestridge's arm. McCarthy and Prestridge at foot plant. By the time they hit foot plant, there's only one evident difference between the two: Prestridge is pulling his glove arm back toward second base. McCarthy's glove arm is essentially dead weight, while Prestridge's arm helps create additional rotational force through his shoulders. 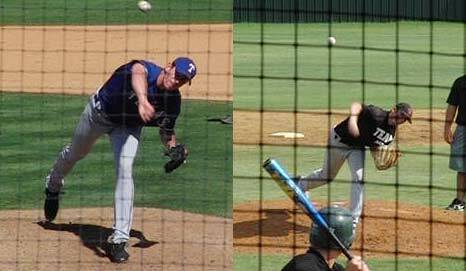 McCarthy and Prestridge at peak elbow height just before elbow extension. 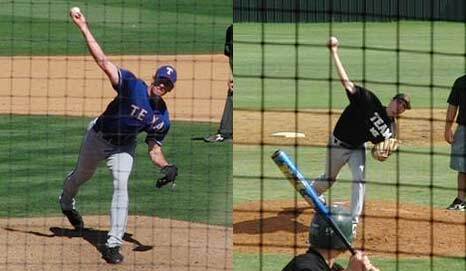 Again, the only difference is the glove arm action and position, though it appears that Prestridge has a greater degree of trunk tilt toward 1B. McCarthy and Prestridge at full arm extension just prior to release. At this point, the pitchers are literally inches away from letting go of the baseball. Prestridge is able to reach a little more toward vertical, thanks to his 1B-side trunk tilt. McCarthy and Prestridge after primary arm deceleration. After release, the pitching arm continues internal rotation while the body tries to keep the arm from flying out of socket. This frame attempts to capture the moment where internal rotation stops. What's clear in this frame is that McCarthy's arm continued to fly forward, winding up closer to his head than to his chest. Prestridge's arm, on the other hand, is still essentially at shoulder level. This is the most significant difference between the two deliveries. With McCarthy's arm positioned like this, the head of his humerus is placed in an anatomically questionable position while his rotator cuff applies extreme compressive force at the glenohumeral joint, driving the humerus awkwardly into the scapula. Prestridge's arm is in a more natural position at this point, and as a result, I do not view his mechanics as risky despite their on-the-surface similarity to McCarthy's old, problematic mechanics. McCarthy and Prestridge after complete deceleration of the arm. McCarthy and Prestridge during the recovery stage after their follow-throughs. You can follow Marvin Prestridge's season here: University of Texas at Dallas Baseball.